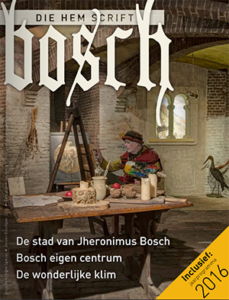 Bossche Kringen is the magazine of Kring Vrienden van ‘s-Hertogenbosch. It appears at least six times a year. Bossche Kringen is published since May 2014 and is the successor of KringNieuws and Bossche Bladen. Members of Kring Vrienden van ‘s-Hertogenbosch receive a printed copy of the magazine free of charge at home. Single copies are available at € 4,95 at the Kringhuis, Parade 12 among others. Below you see the cover and an overview of the articles published in the latest edition of Bossche Kringen. All volumes of the KringNieuws are available online. On the occasion of the JB500 year, Kring Vrienden published a special issue about Hieronymus Bosch with a complete agenda for the year 2016.